Jardineros de Placitas is a non-profit organization in existence since 1965. Our organization is governed by a Constitution and Bylaws; there are Standing Policies. Bylaws and Standing Policies are regularly reviewed and changed as required to meet the needs of the membership and fulfill the goals of the organization. 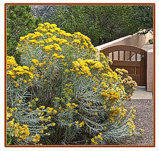 Jardineros de Placitas has a Board of Directors that includes representation by elected officers and committee chairs. Each officer and committee chair position has a job description. Job descriptions are reviewed and revised as needed. Below are links to downloadable copies of our Constitution/Bylaws, Standing Policies and Job Descriptions. a current listing of board of directors and committee chairs is available on the Membership page. The Club logo, which incorporates both the Club's color (yellow) and flower (Chamisa) was adopted as a result of a 2013 contest, which was won by Natalie Searl. The logo is used for letterheads and name tags.